or read below and see what the critics have to say about the game! Keep current on news about future games and updates! Or follow us on Facebook for previews on our next games! "So seriously, go download Mage Gauntlet. The time you spent reading this review could've been much better spent playing this incredible game." "I'll be straightforward on this one: Mage Gauntlet is one of the best iOS games of the year. It's a throwback RPG to the 16-bit days of Secret of Mana and The Legend of Zelda: A Link to the Past..."
"Don�t think twice about spending mere pocket change on what will likely be remembered as one of the App Store�s great indie classics." "The indie team at Rocketcat has created a polished and gratifying love letter to the 90s action RPGs of yesteryear." "This is just the first part of a trilogy that is bound to become an iOS classic." 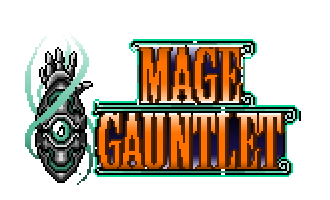 "Mage Gauntlet is a should buy for the price that anyone can enjoy whether they reminisce about SNES RPGs, or have never even heard of the genre. The game is overloaded with action, personality, and most importantly fun that is the best of the genre in the App Store." "What�s here is a game that dares to be different from its brethren on iOS." "Mage Gauntlet is the kind of Action-RPG we've been waiting for on the iOS - a combination of intuitive controls suited to iDevices; fast-paced action split in to bite-sized chunks; and plenty of meaningful unlockable features makes it perfect for gamers on the go." "In the mean time �Ewhat are you waiting for? �Epick this amazing RPG up now! Go!" Earlier footage of the game. See Lexi talk to a bunch of wizards that are jerks, then smash a bunch of monsters that are jerks. 42 levels of sword swinging, spell slinging adventure! Mix and match loot to support your playstyle! Beat the game to unlock Master Mode's 42 extra levels!